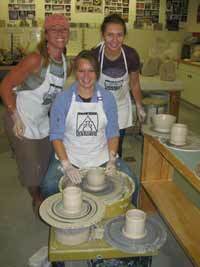 Make a bowl on Saturday, Oct. 13, and help fight hunger in the Wood River Valley. Boulder Mountain Clayworks will hold its third annual Bowl-A-Thon in which volunteers make handmade bowls, to be filled with food and sold to benefit The Hunger Coalition. For the past three years Boulder Mountain Clayworks and The Hunger Coalition have joined forces to raise awareness and money for people of the Wood River Valley who struggle to buy food for themselves and their families. This event is modeled after the international grassroots Empty Bowls project. More than 600 bowls have been sold locally. Handmade bowls, including those made this Saturday, will sell for $20 on Jan. 20 at Presbyterian Church of the Big Wood in Ketchum. Various restaurants and caterers will donate food to fill the bowls. Boulder Mountain Clayworks will donate all supplies and studio time at the Oct. 13 event and lend a hand to those with less clay experience. Doors will open at 10 a.m.